My fellow Washingtonians had an opportunity to ask questions of the Metro Transit Police Chief about the new bag search policy via an on-line forum conducted by the Washington Post (Metro Transit's Top Cop Discusses New Search Policy). Several of the questions went right to the essential pointlessness of the program, and the Chief didn't have any good answers. Metro Transit Police Chief Michael Taborn was online Tuesday, Oct. 28 at 1:30 p.m. ET to take your questions about the department's new policy of inspecting bags for explosives. Rockville, Md. : Hi, thanks for taking questions on this important policy shift. Can you tell us how many times have the searches in the New York City and Boston systems have discovered any credible evidence of sabotage or terrorism, such as explosives? Michael Taborn: Unfortunately, we cannot provide numbers for the programs in New York and Boston. But there is a growing consensus in the transit industry that these inspections are a valuable security initiative. Silver Spring, MD: People don't approach metro station entrances in single file. So how can you really count off every 17th (or whatever) person? That just seems like a handy excuse to have ready when you get caught engaging in profiling. Michael Taborn: We can do adequate job of counting passengers as they enter a station. Washington, D.C.: How can they stop every 15th or 17th or 21st person? People enter in mobs, not single-file lines. Also, if the transit police stop someone who isn't the "every 15th person" or whatever, couldn't that person refuse because they weren't chosen randomly? Can you ask them to prove to you that you were the next person in the preset formula? Michael Taborn: A supervisor will designate one officer with the specific task of counting the passengers as they enter the station. Washington, D.C.: I am opposed to these searches and plan on refusing any Metro officer's request to go through my bags. Because I'll be allowed to refuse search and turn around without being detained, I will simply enter the Metro through another escalator or elevator. How do you plan on addressing this loophole? Michael Taborn: You may choose not to be searched and leave the station with your bags or other items. We do have a plan to address suspicious behavior. And the best question of them all came from "Green Line Rider," followed by the worst non-answer from Chief Taborn. Green Line Rider: If you're not going to search every single person coming into a Metro station, how is the policy effective? Anyone with illicit substances will simply refuse to be searched and go to another station. If you don't search everyone, then it's not worth doing. If you do search everyone, then you'll probably lose half your ridership out of frustration with the delays (think security lines at the airport). Why not just take those officers and put them more visibly on the platforms and in the trains/busses? I certainly will think twice about riding Metro if I'm going to be randomly selected. I consider that an infringement of my rights for no apparent gain in security. Michael Taborn: Legal authority to inspect packages brought into mass transit systems and other venues has been upheld by the courts in numerous jurisdictions. Metro's inspection program is very similar to the one conducted in the subway system in New York City. The United States Court of Appeals for the Second Circuit has specifically ruled on the constitutionality of the New York program in MacWade v. Kelly. Hey Chief, you better get used to being asked how you can justify carrying out an intrusive inspection program that has no apparent benefit. That ruling you cited from the Second Circuit Court has no bearing on the central question of whether searching bags is a good idea or just a waste of time. It doesn't even preclude a court challenge, since the Second Circuit does not cover the Washington region. The curtain is rising on a new act of security theater, a branch of the performing arts that is depressingly familiar to those of us who live or work in the Holy City of Washington. Already we can't enter most office buildings without doing the security dance at the metal detector and x-ray machine. Now, the Washington Metropolitan Area Transit Authority has announced that Metro Police will start conducting inspections of passenger's bags (Metro Transit Police to begin bag inspection program). The Metro Transit Police Department (MTPD) will begin a bag inspection program and look into passengers’ bags prior to them entering the Metro system in an ongoing effort to protect Metro riders, employees and facilities. Officers will be inspecting bags for explosive devices. This is really a roadshow version of an original production that began in New York City shortly after the July, 2005, London Underground bombing. So far, terrorists have conducted bomb attacks in the subway systems of London, Mumbai, Madrid, and Paris. But none of those cities routinely screen passengers, since it just isn't feasible to do so given the large volume of passengers and the vast size and interconnectedness of urban metro systems. What's more, metro stations aren't suitable for conducting screening in an area away from concentrations of passersby, therefore they have no possible defense against suicide bombers. So those cities choose to accept the slight risk that one out of their millions of train passengers will be a bomber. New York City, even though it has not experienced a subway attack, started to inspect its passengers at random and on a voluntary basis, despite the pointlessness of such partial measures. It also provides a high-profile police presence in the subway as a presumed deterrent to would-be terrorists. SWAT [Studly Wear and Theatrics] cops hang out on the subway platforms modeling the latest tactical gear and making like they're on high alert for signs of al Qaeda activity, whatever those might be. Reportedly, that kind of performance makes people "feel better." Not me, and not anyone I know, but supposedly somebody, somewhere. Metro Police have put up Frequently Asked Questions about the new bag inspection program on their website (MTPD Security Inspection Program FAQ), some of which I've repeated below. As a public service, I've added a few questions, in bold italics, that should be frequently asked but aren't. Q: Why is Metro doing this? A: Metro is inspecting passenger bags to deter terrorist attacks by increasing our potential for detecting explosives or other hazardous material into the Metro system and to disrupt the ability of terrorists to discern a pattern in our security measures. The effort aims to increase awareness of the overall safety of passengers and employees in the Metro system and to ensure continuous operations during periods of heightened security in the National Capital area. Are you sure Metro isn't doing this simply to follow the fashion set by NYC? The London metro system doesn't do this and they've actually had bomb attacks. Q: How will the bag inspections be conducted? A: A select team of trained officers may inspect passenger carry-on items prior to their entering the rail system or boarding a Metrobus. All carry-on items of passengers who enter a Metro facility will be subject to these inspections. In general, customers will pass through inspection points prior to passing through a Metrorail faregate or boarding a Metrobus (before paying a fare). A customer whose items have been randomly selected for inspection will be taken to the inspection site off to the side. The customer will be asked to open his or her carry-on item. An officer will visually inspect the contents of the item. The inspection will be limited to searching for explosives and other items that may be harmful. Areas of bags that aren't capable of concealing an explosive will not be opened. If an explosive detecting canine is present, the customer may be asked to have his or her carry-on item sniffed by the canine. If the canine alerts for the presence of explosives the officers have legal authority to search the item, per United States v. Place. In the event that neither the visual inspection nor the canine sniff reveals the presence of explosives, the customer immediately will be allowed to go on his or her way. Customers who aren't selected for an inspection will be allowed to enter the Metro system immediately. Customers who refuse to cooperate with the inspection will not be permitted to enter the Metro system with their items. So, if I'm not permitted entry with my bag because I didn't cooperate, what's to stop me from just emptying the contents of the bag into my coat pockets and coming back? And if I want to keep my bag with me, does that mean I won't be permitted to re-enter that station ever again, or just for the rest of that day, or for an hour, or what? How would you know if I went to another station? It doesn't seem like you could enforce that ban on re-entering metro. Q: What types of bags will be searched? A: All types of carry-on items are subject to inspection including, but not limited to purses, briefcases, backpacks, gym bags, suitcases, shopping bags and boxes. Why search only bags? Don’t terrorists sometimes carry bombs on their bodies, like in those hotel bombings in Amman, Jordan, a few years ago? Can’t a bomb intended for use on a metro train or bus be small enough to carry under a shirt or coat? Didn’t the bombs used in the London Underground attacks weigh just a couple pounds each? Q: How long will it take to do a bag inspection and ensure it's thorough? A: The time it takes to inspect a bag will depend on the size of the bag. In general, it should only take about eight to 15 seconds to inspect an item such as a briefcase or backpack. So, then, I take it you won’t use an explosive trace detector to see if a passenger has explosive residue on his person or effects? Can a brief visual inspection of a bag really be effective? How do you guys know what a bomb looks like anyhow, especially if it's inside an innocent object? Q: What type of reaction do you expect to get from customers? A: We expect customers to voluntarily comply. Don’t you expect a lot of them will turn around and leave the station rather than be hassled? That’s what I would do. Or maybe pass my bag to a friend who wasn't being singled out for inspection. Or, if I was a terrorist, I'd have an accomplice enter the station first and let me know if it was clear for me to proceed with my bomb. Q: How did you determine when and where to do the bag inspections? A: The Metro Transit Police Department will begin randomly inspecting passengers' carry-on items before they enter the Metro system when circumstances warrant heightened vigilance, such as an elevated security threat. However, we will take steps to ensure that there will be no discernible pattern to these inspections. The dates, times and locations of security inspections will not be announced in advance. Doesn’t that decision have a lot to do with available funding? Is Metro getting a Homeland Security grant to pay for the manpower needed to do this program (the way New York City does)? If so, are you really sure this is the best use of those funds? Q: Can't you do this system wide? A: Metro is not looking to conduct inspections at all stations at all times. But if you don’t do it system-wide, what’s to stop a terrorist from walking out of one station and then entering another one? In the downtown area, many Metro stations are only a few blocks apart. Now that I think about it, how could you conduct inspections in Metro Center unless you covered all of its many train lines and platforms and entrances at the same time? Nothing short of comprehensive would be effective. Q: Will this really make a difference? Are you sure about that? I don’t see how it could actually deter or prevent a bombing attack in the Metro. It seems like something that's intended to make people think that Metro is on top of this terrorism threat, when really Metro is just as vulnerable as ever. Q: What took so long for you to decide to do this? A: We have been carefully watching developments in the transit industry, communicating with our counterparts in other systems and evaluating recommendations of the U.S. Department of Homeland Security (DHS). There is a growing consensus within the industry that programs such as this are a good idea, and the DHS touts it as a Smart Security Practice. We believe the time has come to offer our customers this additional layer of protection. With the upcoming elections and inauguration, this is the right time to launch this effort. No, really, what made you decide to do this? Q: Will customers be required to pass through inspection points? A: No. Signs will be posted to inform customers about the inspection point. Customers may choose to avoid the inspection point and not enter the Metro system. Doesn’t that one fact alone pretty much make this bag inspection business an exercise in futility? Is Hummus a Terrorist Group or a Delicious Chick Pea Dish? Two years ago, Congress directed the Department of Homeland Security's Office of Intelligence and Analysis to study the feasibility of creating a domestic counterterrorism intelligence agency - which really means to study the feasibility of taking that function away from the Federal Bureau of Investigation. DHS contracted with the RAND Corporation, asking them to consider the question of whether a new organization could improve current domestic intelligence operations, and RAND has now released its report on that matter. I think the report is disappointingly wishy-washy, full of 'on-the-one-hand-this but on-the-other-hand-that' type of discussion, and it mostly talks around the central question: do we or do we not need an alternative to the law enforcement-centric FBI in order to have an effective domestic antiterrorism effort? Yes, we do, but RAND seems to be afraid to break the FBI's rice bowl by saying that in so many words. RAND did throw out a few good tid-bits about the benefits of creating a new agency. A separate agency could bring clarity to the preventive security mission of a domestic intelligence agency, which is something the FBI will never do so long as it's divided into separate police and intelligence elements. Furthermore, a separate service would be able to draw from a broader recruitment pool; officials in domestic intelligence services in other democracies told RAND they felt they were able to attract talent not normally drawn to a law enforcement culture. That last point - the fact that distinctly different types of people are attracted to police and intelligence agencies - is a big one in favor of replacing the FBI's National Security Division with a whole new agency. The FBI recruits people who, in the main, are unabashed cultural illiterates [my personal opinion, obviously, but one that I formed based on experience working in law enforcement type environments; Socrates said the unexamined life is not worth living, but I know lots of Federally-employed people who live it all the same, and they seem content]. See this and this for examples of what I mean. Why should an FBI agent have to learn the difference between Sunni and Shite, or Iran and Iraq? It's all a lot of confusing foreign stuff, and busy agents can't be bothered to try to learn such trivia. The senior leadership is just as obtuse in that regard as the rank-and-file agents. Consider this clip from a video deposition by Dale Watson, the former FBI Counterterrorism Division Director, in which he lamely insisted that it would be immaterial whether the IRA or an Islamic extremist group were the object of a bombing investigation because "the basic elements of the crime are the same." That's the police mentality. It has its place, but that place is not in an intelligence or couterterrorism agency. The anglophonification [if there is such a word] of Rwanda may be a good thing for the Rwandans, but I suspect it will be a bad thing for me. Central Africa is now the only place on earth where I can speak French without being laughed at. Once they stop speaking it, where will I find non-snooty people to converse with en francais? Maybe if I go back to school I can work my way up to a respectable French Canadian level of fluency in two or three years. In another blow to the language of love, the Rwandan government has decided to change instruction in schools from French to English. All government employees are now required to learn English, and everyone here from lawmakers to taxi drivers to students to businesspeople seems to believe that the usefulness of French, introduced by Belgian colonizers, is coming to an end. It seems the University of Pennsylvania's Institute of Contemporary Art is having a showing of R. Crumb's artwork (Digging 'Underground'; In a Temple of High Art, the Lowbrow Work Of R. Crumb Certainly Rises to the Occasion), and the Washington Post has done a good deed by telling its readers about it the week before the Presidential elections. I'm sure all of R. Crumb's artistry is just as transgressive and avant garde and whatnot as the WAPO article say it is, but the part of it I always liked best was Mr. Natural, his critique of phony gurus and their needy followers. 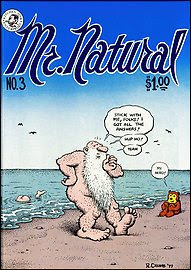 Crumb created the cartoon character of Mr. Natural for an 'underground' San Francisco newspaper in 1967, and it also ran as a series in the Village Voice during the mid-1970s. Mr. Natural, the self-proclaimed "only knower of the cosmic secrets alive today," was a rather ill-tempered mystic of hazy origins who had renounced the material world and went about the San Francisco Bay area dispensing his wisdom to '60s burnouts in return for their admiration and - even better - cash. The demand for perfect masters was so high in the '60s that even suspect sages could thrive, and Mr. Natural was the perfect comment on that situation. It was quite timely to be reminded of Mr. Natural just eight days before the nation will, in all likelihood, elect a messianic cult figure President. Any politician who wants his campaign to be "the occasion, the vehicle, of your hopes, and your dreams," and who speaks of remaking the world "as it should be," and who says he feels "a righteous wind at our backs," has departed the realm of politics and is way, way, over into mystic territory. 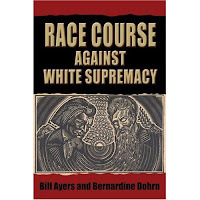 Bill Ayers, the superannuated New Left radical and former Weather Underground bomber, and his lovely wife Bernardine Dohrn, who was a regular La Passionaria to the bomb-tossers back in the Weather Underground's heyday (you can read all about it in Ayer's memoir of that time), have jointly authored a book about how white supremacy is the driving force in American life. Race Course Against White Supremacy is scheduled for release next June, but may be pre-ordered now at Amazon.com. William C. Ayers is a distinguished professor of education and a senior university scholar at the University of Illinois–Chicago. He is the author of To Teach: The Journey of a Teacher and Fugitive Days, a memoir about his life with his wife, Bernardine Dohrn. Bernardine Dohrn is the director of the Children and Family Law Justice Center and a clinical associate professor of law at Northwestern University. She is the coauthor of A Century of Juvenile Justice and Justice in the Making. They live in Chicago. Barack Obama publicly praised an earlier book by Bill Ayers, but that was way back in 1997. Now that Obama is running for President he doesn't remember ever knowing Ayers, so I doubt he'll offer so much as a book jacket blurb for the geriatric ex-terrorist's latest work. 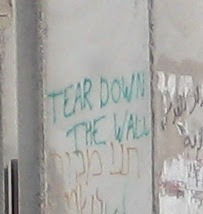 I saw this message written on the separation wall next to the checkpoint on the Jerusalem-Ramallah road. I assume it's intended as a reference to President Reagan at the Berlin Wall, however inaptly, since the Israelis certainly did not put the wall up to keep their population from fleeing to the West Bank. The Berlin Wall lasted from 1961 until 1989 and the beginning of the end of the Cold War. It's hard for me to see any scenario under which the West Bank separation wall will be dismantled short of an end to the Israeli-Palestinian conflict. And, having read the Palestinian National Charter and the Covenant of HAMAS, both of which utterly reject any division of historic Palestine, I cannot foresee an end to that conflict unless one side or the other someday loses its national identity and dissolves. It's hard to watch the suffering of the innocent Palestinians as they negotiate the checkpoints. On the same day my party crossed the Israeli green line into the West Bank, we heard that a woman who had gone into labor prematurely while at that same checkpoint lost the baby when the Israeli troops wouldn't call an ambulance. I couldn't confirm that story via the local press, but I can believe it. Border guards are callous the world over. Moreover, from purely anecdotal evidence as well as my own observation of the troops manning the checkpoints, I suspect there is a high percentage of Russians and other recent immigrants serving in the Israeli military and Border Police, which probably adds to the cultural distance between the guards and the guarded. However, I also remember the suffering of the innocent Israelis during the hundreds of terrorist bombings that took place inside Israel during the second Intifada, killing around 1,000 persons as they went about their daily business in buses, schools, restaurants, markets, etc. The savagery of those attacks, and the gleeful celebrations in the West Bank that accompanied them, were truly striking. Were I an Israeli, I would have been all out of sympathy for the victims on the other side after a few incidents like the Ramallah lynching. 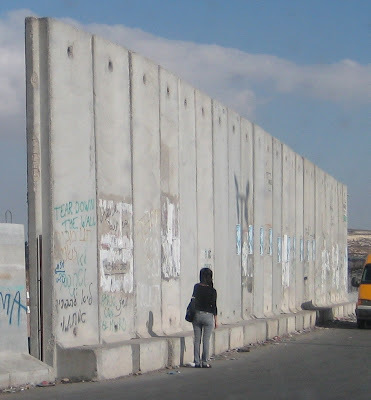 The separation wall has had one big redeeming feature: after its construction began in 2002, it quickly reduced the number of attacks launched from the West Bank and, hence, the tensions. The below chart is from a biased source, but I can find nothing wrong with its figures. 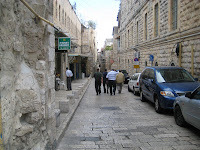 I had a brief chat last week with the security officer for one of the United Nations program offices in Jerusalem, and it confirmed what I'd suspected from recent press reports. The UN Department of Safety and Security was thoroughly burned by the still-not-fully-released internal review of the circumstances surrounding the bomb attack on the UN headquarters building in Algiers last December, and the organization is expecting a further purge of the leadership. The UN/DSS Director had the grace to resign right after the attack, but his senior staff remains in place, at least for now. The UN field security officers seem to be walking on eggshells today, since their leadership in New York has gotten excessively cautious and risk-averse. Unfortunately, an unwillingness on the part of Headquarters to tolerate any amount of risk is no more realistic or practical than the opposite extreme. Incidents like the Algiers bombing make a security bureaucracy gun-shy, and the effect usually persists for a few years before a sensible risk management attitude eventually emerges (if it ever does). 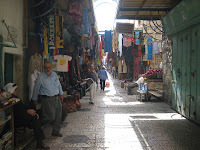 While TDY in Jerusalem last week I stayed in the eastern (Arab, that is) part of the city, and had a few experiences with the borderline between Arab and Israeli territories. The least serious of these was at the Borderline Cafe, a restaurant that is so named because it sits on the 1948 armistice line between East and West Jerusalem. It's a nice place and I enjoyed eating there, however, the names of the dishes could be a bit off-putting to a native English speaker. For instance, the "Borderline Pizza." Having heard the theory that there is no such thing as bad pizza, since even when it's bad it's still pretty good, I was curious as to whether there is such a thing as borderline pizza. 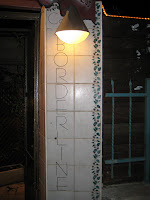 I'm happy to report that the Borderline Pizza was actually rather good. The American Colony hotel has hosted many renowned guests from all walks of life: Sir Winston Churchill, Laurence of Arabia, Sir John Gielgud, Lauren Bacall Peter O’Toole, Marc Chagall, Alec Guiness, Richard Widmark, Joan Baez, Richard Gere, Leon Uris, Donald Pleasance, John le Carre, Graham Greene and the Empress of Ethiopia, among many other celebrities and dignitaries, have all made the Colony their home away from home. But the above list is missing one especially renowned guest. From a plaque in the hotel lobby I learned that none other than CHUCK NORRIS himself has stayed at the American Colony. Now I'm impressed. Who are Winston Churchill and Laurence of Arabia compared to Walker Texas Ranger! I'm back from a quick business trip to Jerusalem and Ramallah, during which I earned danger pay by risking deep vein thrombosis from enduring excruciating economy class flights of well over 14 hours. 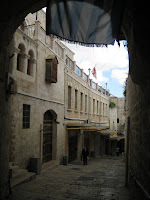 While I'm collecting my thoughts about the West Bank and the border crossing checkpoints that separate it from 'green line' Israel, here are a few tourist-y photos from Jerusalem's Old City. 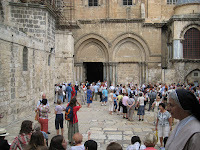 The entrance to the Church of the Holy Sepulcher, packed inside and outside with religious pilgrims. After spending a long weekend mowing lawns, raking leafs, trimming hedges, chopping firewood, and building a compost pit, I'm ready to get out of town and live in a hotel for awhile. I'll be in Jerusalem for the rest of this week, carrying out boring official business and maybe visiting some favorite historical sites. 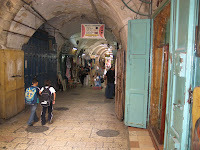 There is a very narrow window between Israeli holidays during which business can be conducted this week. Succot, the Feast of Tabernacles, begins prior to sunset today, Monday, October 13, and ends on the evening of Tuesday, October 14, just as I'll arrive in town. And I'll have to scoot back home before Simchat Torah, the Rejoicing of the Law, begins prior to sunset on Monday, October 20. The Washington Times' UN correspondent seems to be almost alone - certainly alone among Washington DC news media - in covering the United Nation's internal review of the car-bombing of its headquarters in Algiers last December. See Dual roles said to put U.N. staffers at risk , the text of which is copied below, and U.N. faults 7 in Algeria bombing. The latest development is a heavily redacted report, released last week, that acknowledges systemic weaknesses in the UN's new Department of Safety and Security and its country threat assessments. In brief, Algiers was rated low on the UN/DSS threat ranking system despite having an active and long-standing indigenous terrorist threat and an emerging transnational threat. Apparently, the Resident Representative in Algiers and other UN officials did not wish to raise the threat ranking to a realistically high level for fear of offending the host government. A low threat ranking has logical consequences when resources are allocated by the UN/DSS in New York, so Algiers did not receive the perimeter security enhancements its security advisor in Algiers had requested long before the December 11 attack. By the time the Algerians discovered evidence of targeting (a sketch of the UN's Algiers headquarters was discovered on a cell phone in the possession of an al Qaeda affiliate) it was far too late to start constructing the kind of anti-ram vehicle barriers that would have limited the damage done by a vehicle-borne explosive device. There are two lessons to be learned here, both of which will be familiar to those of my colleagues who remember going through very lean years of security funding in the 1990s. First, effective anti-ram barriers cost a lot of money, and they are notoriously difficult to incorporate into city streets, most of which are already full of buried water, gas, power and sewage lines that run where the barrier footings need to go. By the time you know for sure you'll need them, it's far too late to start the necessary planning, budgeting, and asking for municipal permission to tear up city streets. UNITED NATIONS Inherently flawed security is compromising the safety of tens of thousands of U.N. employees around the world, according to the organization's third report on the fatal Dec. 11 bombing of U.N. offices in Algiers. Algeria, where an explosives-packed truck bomb killed 24, "was not on the radar screen" for U.N. security officials who, said the authors of the report, "were preoccupied with Afghanistan, Iraq, Lebanon, Somalia and Sudan." Ralph Zacklin, former U.N. legal adviser, led the five-person inquiry to assign responsibility for the attack. Seventeen of those killed were U.N. staffers. On Sunday, Mr. Zacklin's panel submitted to U.N. Secretary-General Ban Ki-moon an 88-page report with thousands of pages of annexes. Mr. Ban's office has refused to release that document for security and privacy concerns, but on Wednesday distributed a four-page summary of the report. Shortly after 9 a.m. on Dec. 11, 2007, a truck bomb barreled past a minimal barrier and slammed into an office used by several U.N. agencies. Fire engulfed the building. In addition to those killed, scores were injured. Most were Algerian. Responsibility was quickly claimed by a local insurgency called al Qaeda in the Maghreb, a group that had been publicly agitating against the presence of the United Nations and other foreign organizations in Algeria. There had been several bombings in the capital over the preceding months that were claimed by the same group. Nonetheless, out of courtesy to the Algerian government's political sensibilities, U.N. officials did not raise the threat assessment, nor vigorously demand additional security measures to be put in place, the report said. Despite these threats, and the repeated pleas for assistance by local security officer Babacar Ndiaye to the U.N. Department of Safety and Security (DSS) in New York, nothing happened. Mr. Ndiaye was killed in the explosion. Marc de Bernis of the U.N. Development Program (UNDP) was responsible for conveying security concerns to the Algerian government because he was the most senior official at the post. He was also responsible for running his agency's programs in the region. Mr. Zacklin said this dual tasking, standard in most U.N. duty stations, is a "design flaw" that must changed. "It's not hard to imagine that a person wearing two hats may find himself or herself in conflict," he said. Mr. de Bernis, a French national who has since been posted by UNDP to Brussels, is currently on medical leave, according to a UNDP spokesman. The UNDP Wednesday acknowledged the difficulty of the post. "As Mr. Zacklin said, there are clearly built-in tensions between the twin responsibilities, of security and program delivery, assigned to the head of a U.N. field office," UNDP spokesman Stephane Dujarric wrote in an e-mail. "Therefore, it is of the utmost importance that we address these built-in ambiguities in the U.N. system's security architecture so as to better clarify issues of functional and personal roles and responsibilities in the future." The Zacklin panel also found that at U.N. headquarters in New York, the security department was hobbled by poor training and recruitment, limited resources and other problems. Two previous U.N. reports on the Algeria bombing also paint a grim picture of an understaffed department constrained by hierarchy and turf wars, in which bad news was unwelcome. The next president must develop a more effective and disciplined way of communicating to the public about what kind of threats the country faces and what individuals and families can do to be prepared for disasters, a panel of homeland security experts said Friday ... The next president, regardless of which party wins, will be able to chart a new course for communicating with the public, according to experts at a panel discussion hosted by the Center for American Progress. "I think that, by and large, the president needs to reassure the public that they are not going to see a repeat of what went on for the last eight years," said Jerome Hauer, chief executive officer of the Hauer Group and former HHS assistant secretary. "The public is fatigued," he added. 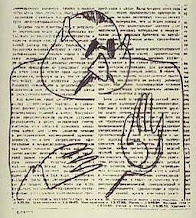 "They are tired of the sky-is-falling mind-set." He said the next president needs to ensure that public warnings are based on solid information and that the federal government sends out messages out of an urgent need, not because it wants to distract the public. It's a coincidence of timing, but the panel could have been talking about the warning (or "analytical note") that the FBI and DHS sent to law enforcement this week and which was leaked to NBC News. The FBI and Department of Homeland Security today issued an analytical "note" to U.S. law-enforcement officials cautioning that al-Qaida terrorists have in the past expressed interest in attacking public buildings using a dozen suicide bombers each carrying 20 kilograms of explosives. Authors with the U.S. Office of Intelligence and Analysis added that they have "no credible or specific information that terrorists are planning operations against public buildings in the United States." The FBI and DHS analysts said they were releasing the note because "it is important for local authorities and building owners and operators to be aware of potential attack tactics." Once again, the sky is not falling. There is no impending attack to warn about, and no feasible steps law enforcement agencies, or building owners, could take to prevent the scenario the FBI and DHS want them to be aware of. So why send this warning out? Where's the urgent need? And sending it during October in an election year is simply begging for cynical political interpretations. I caught only about ten minutes of the second Presidential debate yesterday (due to the demands of a normal family life, I rarely spend my leisure time watching TV in the evenings) but that was enough to hear the name "Pakistan" mispronounced about twenty times. By coincidence, this week my English as a Second Language class is working on long and short vowel sounds, so maybe I was particularly sensitive to how both candidates mispronounced the word such that the last syllable rhymed with "don" when it should rhyme with "man." In McCain's case, he usually said "Pahk-ee-stahn," and Obama always said "Puck-ee-stahn." They're a bad influence on my students. I once had an ESL student from Kosovo who would go into a rage when he heard native English speakers twist the 'Stans - Uzbekistan, Tajikistan, etc. - into 'Stahns. He could see that such people are pretending that a foreign word mispronounced in English is being correctly pronounced in whichever foreign language. But it's not, and people who do that are just putting on airs. If one of the candidates would drop the faux foreign pronunciation and just say "Pak-ee-stan," I'd be so happy I'll vote for him. The State Department has announced that the U.S. Embassy in London will be moving to a new site in a few years, leaving it's prime downtown location in Grosvenor Square for a property to be purchased in a former industrial area on the outskirts of the city near the landmark Battersea power station. Here are stories by the Washington Post and the UK Times. Incidentally, the Battersea power station is a famous coal-fired power plant built in the 1930s, the first in a series that created a national power grid, and it has been a protected historic site since it went out of service in the 1980s. You've probably seen its distinctive four-chimney main building, or its art deco interior, since it has been used as the setting for many television programs set in London, two classic rock album covers (The Who and Pink Floyd both used it) and dozens of movies from 1936's Sabotage to this year's Batman: the Dark Knight. The current embassy property is so extraordinarily valuable that the proceeds of its sale will pay for the construction of the new embassy. The total price tag for this land deal will most likely exceed the $700 million spent on the new Baghdad embassy complex, thus setting a new record for Most Expensive New Embassy Ever. By now, most people will have seen the news about the July 2008 letter sent by Sir Nigel Sheinwald, British Ambassador to the United States, to Gordon Brown, British Prime Minister, to prepare him for a visit by Senator Barack Obama to London. The British Ambassador described Obama as "temperamentally cool" and "maybe aloof, insensitive," and one about whom "the charge of elitism ... [is] not entirely unfair." Wow! When the Brits call you cold and haughty, you ought to take a good look in the mirror. Of course, it might just be that the Ambassador isn't the best judge of American politicians, since he also reported that Obama "demands calm and 'no dramas' from those around him ... That will, I think, be an important criterion for his choice of running mate." Sir Nigel couldn't have been more wrong about that prediction. Joe Biden is never calm, and much of the time he is more dramatic than a Mexican soap opera. Here's a great application for you music lovers. Visit the site at the link above, upload an MP3 from your computer, and then improve it by adding more cowbell. I think Mick Jagger really benefits from that treatment, and I'm experimenting now with an improved version of ABBA's Dancing Queen to surprise my wife. Go ahead, you can really explore the studio space.